We offer a full line of carpentry, concrete, electrical, mechanical and plumbing services. We are also, kitchen and bath experts. We use only top-quality products. 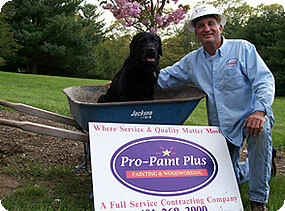 Pro-Paint Plus customers trust us with their large or small construction projects. Make the most of your living space, by letting Pro-Paint Plus, design and build a kitchen or bath that enhances your life. Meticulous planning and quality craftsmanship throughout all stages of remodeling is crucial in creating a functional living space. We understand just how important it is to create the best designs to suit your needs. We pay attention to energy star and green environmental practices, when we involve ourselves with any building project. Custom decks are constructed using all materials that have long life, and are made from recycled products that enhance the quality and life of decks. Hardie products are green renewable recycled products, used on new and remodel construction. We are certified Hardie installers, who have 15 years of experience in the field, and recommend its use because of its 50-year life, and great paint retention. If you have color plus applied to your project, it will be a 15-year product for its paint life. We have an accomplished portfolio of commercial and residential work with Hardie siding and trims. Window and door installation will be executed in a weather-tight manner, using all the latest hurricane waterproofing practices. Using ice and water barriers and lead copper flashings assures the fit, and insulating all openings with dense form makes for comfort and true R value of your high-rated windows. Bathroom remodels are a pleasure for us to design. We can easily make a small bath very user friendly with our remodeling schemes, making the area more than anyone can possibly imagine. We have construction methods that will use space so efficiently, that your bathroom remodel will be a textbook showpiece. We offer custom carpentry that is millwork quality and finished to any design model. If you have a special project, we know we have the resources to replicate any historical, modern, or classical set that may be considered in the remodeling field. We will gladly provide pictures of projects and references that back up this promise. We have a full set of gutter systems available in our toolbox of experience: Copper, wood, and wood- lined. We also have the newest models of leaf guard, and non-clogging water catches available in the market. Finally, we are progressive in the carpentry trades, matching quality and craftsmanship, to give you a finished project that will provide value and long-term satisfaction.